Advantages: Good layout and logical format; well written; conveys useful information; attractive artwork (40 profiles plus plates on front) of a variety of colour schemes; 148 clear monochrome photos. 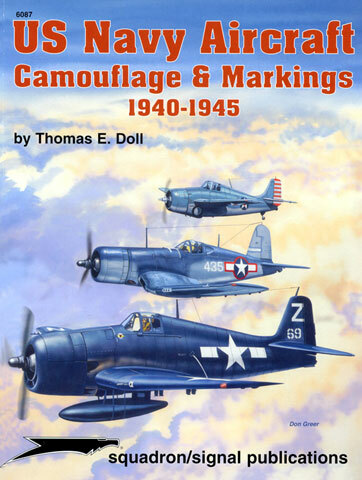 New from Squadron/Signal Publications is the A-4 sized book US Navy Camouflage & Markings 1940-1945 written by Thomas E. Doll and illustrated by Don Greer. The book starts out with a brief overview of the colourful 'Yellow Wings' period of US Navy, Marine Corps and Coast Guard aviation, and from there the reader is taken on journey through the various different camouflage schemes worn by the different types of aircraft that these services operated, the markings they were wore and how and why they evolved. 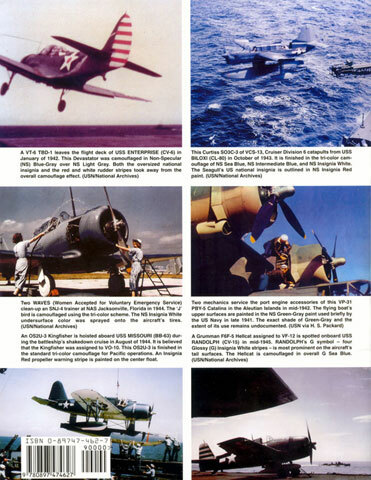 The book follows the Squadron/Signal tried and true format of a brief written explanation followed up with 148 good, clear black and white photographs to illustrate the points made in the text. The text is well written and imparts detailed technical knowledge in an easy to understand manner that both the dedicated modeler and those with just a general interest in the subject will not find taxing. Colour is limited to the six period photographs on the back cover as well as forty side-profiles and the cover painting by Don Greer. The book comprises 64 pages between cardboard covers. This is a good product from Squadron/Signal. It provides complete and detailed information at a very good price.